Everything had its place in Ma-Maw’s kitchen with the picnic basket always placed prominently in the corner, next to a shelf with mismatched plates and bowls. Sometimes out of the blue Ma-Maw would ask if I wanted to go on a picnic? Even though it was normally just in her small back yard she carefully lined the saddle colored basket with a red and white checked cloth. Packing plates, utensils and thermos filled with her favorite, diet tab. No detail forgotten. Though just a few steps from her kitchen to the back yard, she only wanted to make one trip, making it feel like we were traveling a great distance. Our picnics were special. Mom mailed the old picnic basket this week. Traveling from my grandmother’s kitchen, my mother’s home and now here in NYC. Sitting it on the bench in my living room, next to my brown chair where I sit everyday working on my computer. Though the lid is a bit worn and scratched it’s otherwise in pristine condition; strong. Looking at it I’ve heard Ma-Maw’s voice “Daddy, you want milk gravy tonight?” I loved how she always called PaPaw “Daddy”. I’ve also seen her sheets drying in the sun on a clothesline and the reddish green rhubarb growing in her back yard. Always trying to convince me that I really would love her rhubarb pie, if I’d only taste it once. 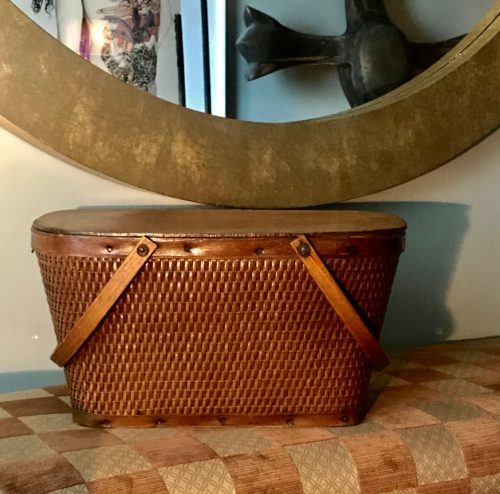 Looking at that old picnic basket I’m reminded how Ma-Maw was an original. She wanted me to just be myself and rejoice in it. And every day that I’m happy to remember her smiling at me.